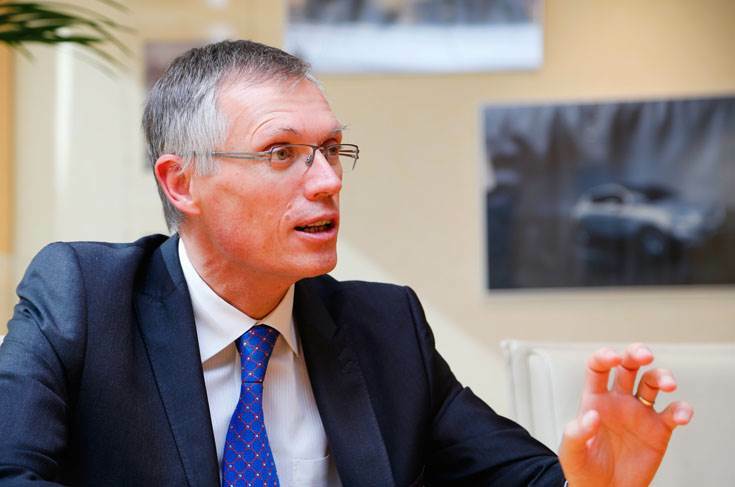 The PSA Group is open to an acquisition or merger with troubled carmaker Jaguar Land Rover, with Group CEO Carlos Tavares suggesting it would be interested "as long as it's not a distraction". Speaking exclusively to Autocar India, Tavares said it will be good to have a luxury brand, something its portfolio currently lacks, and the company is "considering all opportunities". However, he mentioned that there have been no discussions with JLR's owner – Tata Motors – yet. When asked about the possibility of having a luxury brand above DS, Tavares said, "Why not? Why shouldn’t we discuss it? It depends on what kind of value creation we could generate." He added that the Group’s immediate priority is to focus on the second phase of its ‘Push to Pass’ strategic growth plan, which aims to expand the company’s global presence, its product range and focus on electrification and digital technology. A PSA-JLR merger could be a win-win for both companies, especially for JLR, which is in the midst of a crisis and looking at all options to fund future investments. The Tata Motors-owned British carmaker has been saddled with plummeting sales and heavy losses, forcing the company to undertake drastic measures to cut costs. The firm sold 144,602 vehicles between October and December 2018, down from 154,447 units in the same period in the previous year. Jaguar Land Rover posted a pre-tax loss of £3.4 billion (Rs 31,389 crore) in the final three months of 2018, the biggest loss in Indian corporate history, caused by a massive one-off adjustment in the value of its investments. Excluding that one-off charge, JLR posted a £273 million pre-tax loss as against a £90 million loss in the previous quarter of 2018. For PSA, JLR would fill a crucial gap important gap in its portfolio and give the French carmaker access to the global luxury market, which witnessed sales of over 8 million vehicles in 2018. The fact that there would be no brand overlap between its premium marque, DS, and JLR, also strengthens the case for PSA to explore possibilities with JLR. Also, Tata Motors is no stranger to PSA and both companies have had several dealings in the past. In 2001, Peugeot and Tata Motors conducted a feasibility study (Project T53) to manufacture the 307 hatchback and notchback in India but the cost structure of these models was just too high to be viable for the Indian market and, after 18 months, the project was scrapped. In 2014, Peugeot began negotiations with Tata Motors for a partnership to jointly manufacture cars on a common platform but again these talks fell through due to challenges surrounding costs. Currently, the PSA Group has outsourced a substantial chunk of the design and development of its India product line-up to TCS, the Tata Group’s flagship technology company, with an aim to keep a tight lid on development costs. While the Tata Group maybe vehemently opposed to relinquishing control of one of its crown jewels, the unprecedented challenges facing the industry and the eye-watering investments needed to meet future regulations, may leave JLR with no option but to join forces with another manufacturer to spread the risk and cost.